Large screen projection cinema has not changed much since the early 1900s – even though crystal clear digital projection and 3D images are becoming the norm, cinema is still about the shared experience – a large screen viewed with more than four people in a large space…declining? There was a demand for a more immersive experience and although holding an iPod video a few inches from your face actually has the same size of screen as a cinema, it didn’t feel ‘big’ enough. The voice phone has been with us for nearly 100 years – and now a December 2010 survey from Marketing Charts of the US shows Half of all mobile users actively consume media via their handsets. In the 20s and 30s the voice only device became indispensable to many parts of the developed world. it wasn’t until the early 90s that mobiles became small enough to carry comfortably. 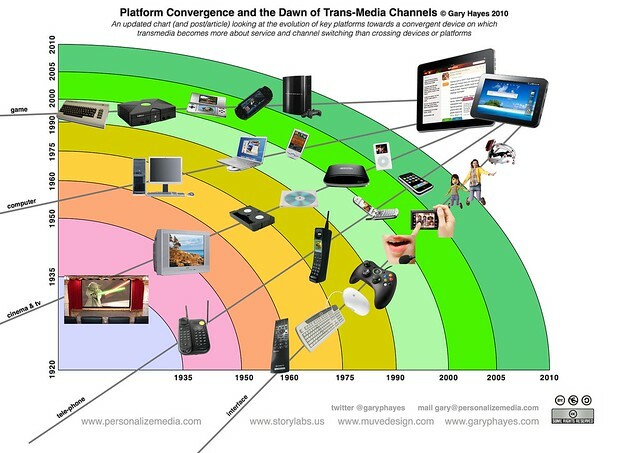 The big sea change to the mobile though happened in 2006 when the iPhone led the way in touch screen, one size fits all convergent ‘smartphone’ thinking – apps, casual games, telephony, texting, photography etc:. But we need a device that is bigger than a normal phone so we can see more, be more tactile and be immersed more but something that we still take and make calls on – we are prepared to deal with a slight weight (500g and less?) and inconvenience if it fulfils our other ten key needs! The personal computer has not gone through many ‘macro’ changes since its introduction in the 1980s. 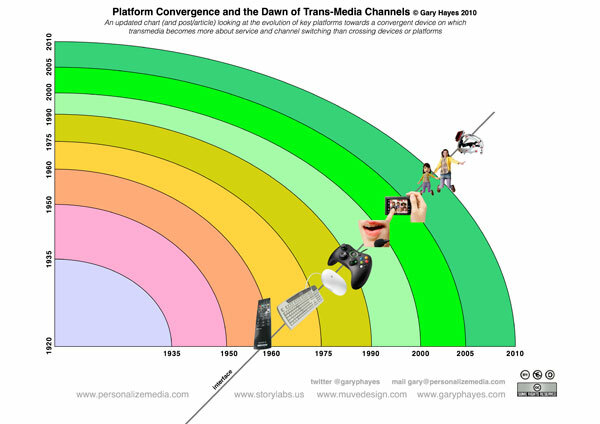 Game platforms are a much simpler evolutionary case study and recently we have seen a massive increase in mobile and smartphone game use in the US and UK – the report from Information Solutions Group show a tripling of users of games on the move since 2009 – details here on Marketing Charts. A battle now exists between casual handheld online games and powerful 3rd generation & motion/body controlled consoles that took the world by storm from 2008 onwards. 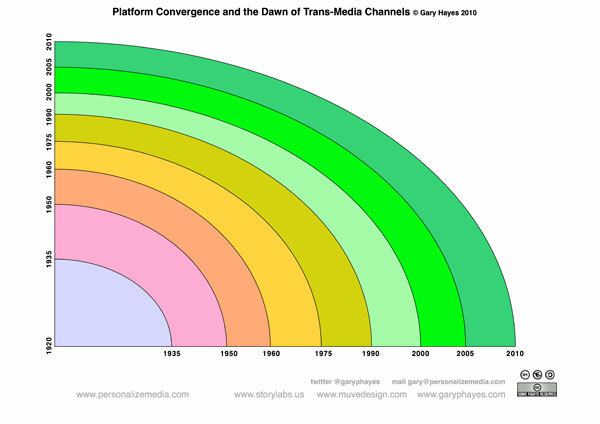 In terms of the evolutionary tale here, are there platform and mediums AWOL from these charts? Goodbye printed word? A critical strand I have left off is of course the written word! It would have made the chart much longer, stretching back a few more centuries at least. Also many folk have covered the death of newspaper due to tablet over the past two years (eg: a recent one from Ross Dawson suggesting tablets will be given away free before the year end!) 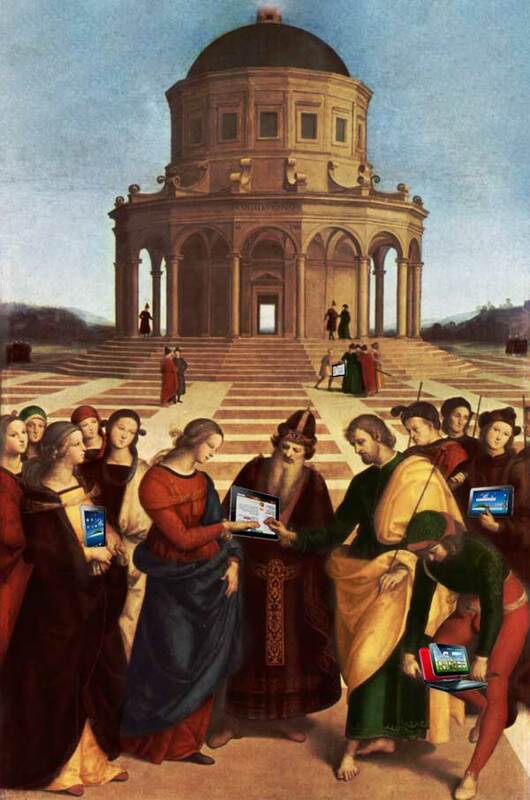 – But even the last hundred years of magazines, newspapers and books would have implied a form that may have had its day, replaced by the plethora of mobile readers and laptop screens? 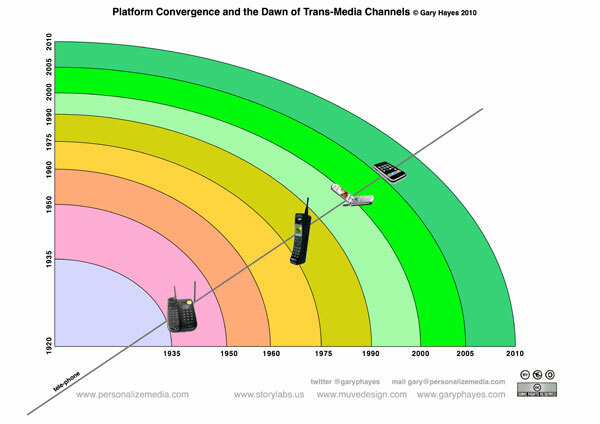 Goodbye broadcast radio (and TV)? Also the radio as a form for most younger media consumers becomes just streamed audio content online delivered to their mobile devices, no different to an offline podcast or audio blog. Goodbye physical av media? In a mobile broadband world with a great deal of content in the cloud, why do we need any disks (DVD, BluRay, Hard Drives) or tapes at all. Everything is stored digitally, partly in the cloud, viewed briefly streamed over broadband to our storage free devices – RIP Blockbusters, RIP DVD, CD, Vinyl and eventually BluRay. Goodbye theatre, opera, orchestras, pop concerts? Will the personalized online choices we all have on our portable, hyper connected devices mean experiential live media is both costly and inconvenient? Or will these be the best bedfellows as we enhance and augment our live experiences with our connected tablets? – interested in your views for that particular hot potato! The Multi Channel Tablet and what will this mean for those telling stories across multiple services? 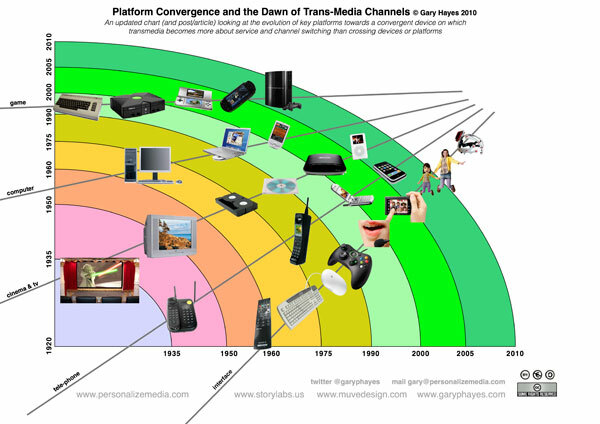 A clear future for tran-service storytellers is the ability to provide a story universe which can be accessed as a whole, sucked (like the proverbial black-hole) into a personalized portal, the users convergent tablet device. 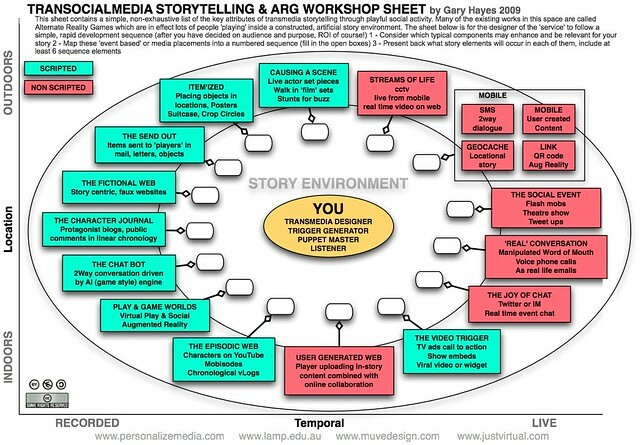 Removing the need to access multiple gadgets & screens the user will feel more in control, more connected as your story permeates their contained, handheld media landscape. But we are getting ahead of ourselves so finally lets get back to reality by looking at the current state of affairs, convergence-wise. A Pew internet report in the last few days looking at Generations and their Gadgets of course tells a useful story in terms of the raw numbers in the US who own the various devices and yes, tablets are still low overall. But remember we need to consider velocity here – looking at the uptake of the tablet and eBook currently at around 10% penetration for the 56 and younger demographics over the last year or so tells us that these are the fastest selling devices ever, in the history of devices – think how long it took games consoles or TV to reach 10% of everyone! Will convergence really happen after all? I dunno, Gary. A tablet device is a good mid term solution for input. But anything larger than 7 inches gets to be a bother in transport. Where do you keep it when not in use? Certainly not a pocket. I take a sports bag to work with me now, but that’s only during the winter months when I need additional items weather related. I used to wear a fanny pack, but I’ve recently gotten away from that as well. I’m of the opinion that a device needs to be pocket-able, but EASILY networked to larger local screens. Because a heads up display is just not going to happen soon enough. Useful perspective (apart from the occasional slight?!) and yes, I and most commentators refer to the adult industry as good examples of matching need with content. Also this post is not just about Apple of course, given most tablets in the market within the year are likely to be a multitude of flavours of Android tabs. As regards predicting the future vs hindsight most of the examples here are spread over decades vs short term so predictions of for example the introduction of VHS precedes me! 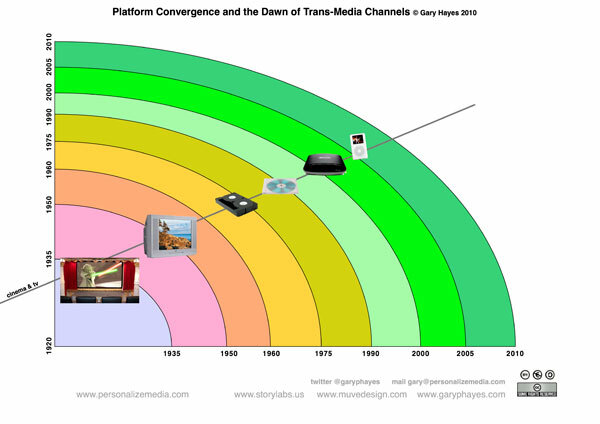 Also if you regularly read my posts I imply behavioural and sociological change in a media context in virtually every post, plus (showing my age) I was actually part of the groups in 90s and early 2000s working on (for example) global DVD and PVR standards, Interactive TV development, broadband video, webumentary, social TV and recently Augmented Reality. Cloud gaming is also going to create some huge changes in the gaming world. Good write up here.